Diehard Tendulkar fan actress Saiyami Kher reviews Sachin A Billion Dreams. There is an old blanket in my cupboard about to give way any minute. But it's the blanket that was wrapped around me when I was born, and I've had it since then. Even now, when I'm looking for comfort, I open the cupboard and pull out this soft piece of cloth and it puts a smile on my face. That is what it feels like when we are re-watching Sachin Tendulkar's life on the big screen. Whenever there was something troublesome in our lives, this one man would make the nation jubilant with his feats and make everyone forget about any impending doom. This film takes us right back to those glorious and happy times, just like the blanket in my cupboard. The Hindi film industry has a way of making everything seem larger than life in their stories. The costumes, locations, dances make us live in this make-believe world and transports us to to a live a life we would have liked to live. But what if it is a story of a simple middle-class Maharashtrian boy? About his mother, about his brother, about him just doing what he loves? The name itself is so iconic for any Indian (especially for those of us who grew up in the 1990s) that there is no need for frills to make his story seem dreamy. His life was 'larger than life' and for that filmmaker James Erkskine and producer Ravi Bhagchandka venture into an almost unchartered territory for commercial Indian cinema -- the docudrama. 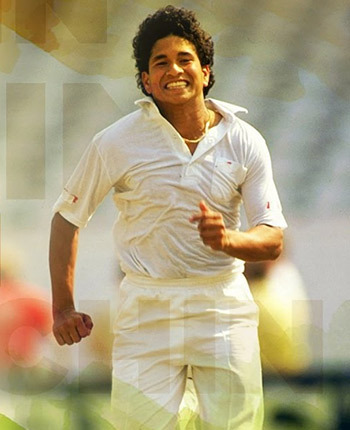 The writers Siva Ananth, Sandeep Srivastava and Ajit Bhure weave so beautifully a tale which includes real footage from Sachin's childhood, his timeless innings, the dressing room stories and so much more. When you hear Tony Greig's unmistakable voice exclaiming, "What a player! What a wonderful player!" while you watch the Master hit those sixes at Sharjah, any Sachin and cricket lover will get Goosebumps. The film even touches on the Greg Chappell era and the dark times of match fixing and how it badly affected the Indian team's morale. Those incidents aside, it is heart warming to watch cricketers narrate their anecdotes with Sachin. While there are plenty of these moments for a cricket lover to relish, even a non-cricket fan will have so much to take away from this film. Be it this legend's middle-class values or catching a glimpse of his childhood, understanding the hard work that went into his career, his interactions with his decades old Sahitya-Sahawas buddies, everything. Hearing Sachin's mother and family narrate what it was like to have a naughty kid -- THE Sachin Tendulkar in the house brings a sweet smile to your face. The footage from his wedding is adorable to watch. And to get a glimpse into the father that he is, simply melts your heart. It also touches upon the behind the scenes moments of what his family must have gone through, and the sacrifices they've all made while Sachin was busy playing for the country just to make each of us ecstatic with his timeless shots. The 1999 World Cup was etched in every Sachin fan's memory. Sachin Tendulkar's father passed away, and he left the tournament to be with his family. While any other person would have spent time grieving such an enormous loss, Sachin flew back to be with the team in two days. The visual of him looking up to his father after a game-winning century has been etched in our memories. The amount of strength the man must have had to leave his family at that moment, and come play for his country and perform his duty truly showed us what he was made of. When Sachin speaks about that moment in the film, we cry with him. It reminds us that we as a nation, owe so much to this one man who has foregone his own happiness, so we could sit in our homes with our families and feel good. The film ends with Sachin's heart wrenching farewell speech where each and everyone of us didn't want him to go. It's a nostalgia trip of the most celebrated sportsman to have graced our planet and leaves us with the chant of "Sachinnnn, Sachinn!" reverberating through our ears and hearts. All that we desire at the end of the film, is to hear the commentator on our screens state, "And the incoming batsman is Sachin Tendulkar", and then watch him take strike for real just one more time.